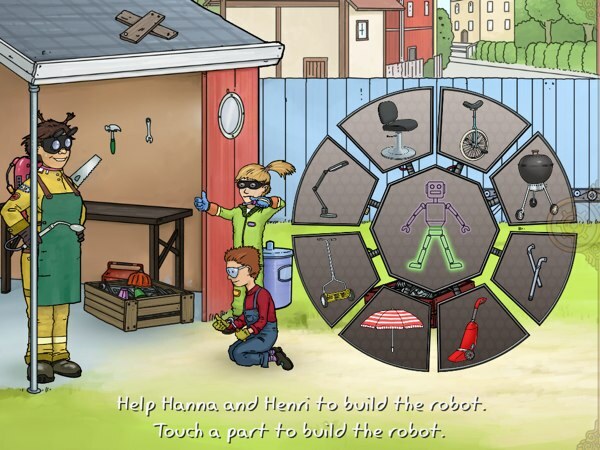 In Hanna & Henri - The Robot, kids can create their own robots by recycling everyday objects. Over the past six months, we have reviewed a couple of apps that promote recycling by letting kids build toys from scraps. Today, I’d like to add another app to this collection: Hanna & Henri - The Robot. It’s a storybook starring two best friends who want to build a robot to water the fruit garden. The storyline starts with an active young girl named Hanna who is getting ready to meet her friend Henri. They are meeting with Hanna’s aunt to build a robot to water the fruit garden. Hanna is late for the appointment, as she always is. On the other hand, Hanna is a very helpful person. When she knows that a truck accidentally hit a fruit shop and knocked all the fruits over, she helps sort the fruits back into the baskets according to their colors. When she finally meets Henri, she doesn’t waste any more time and asks Henri to go to her aunt’s garage immediately. There, they see all kinds of robots. There’s a robot to bring you lab clothes, a robot to find scraps, and even pet robots playing around the garage. After helping a robot named SAM (Sort-All-Materials) sort the scraps, they finally get a chance to build their own robot. They can choose from an array of objects to use for the robot’s leg, body, arms, and head. As they finish building the robot, Spocknick the scientist comes to help and provides the way for Hanna and Henri to bring the robot to life. They give the robot a new name and program it to work in the fruit garden. Hanna & Henri - The Robot is professionally narrated, allowing both readers and non-readers to enjoy the story. It is suitable for kids ages three and up. The story and the mini games are designed around organizing and recycling. There are plenty of options to build the robot and Hanna’s outfit, so kids can design according to their preference. Hopefully it can spark new ideas in their mind for their next DIY projects. If your kids enjoy the story, you might also want to check out Hanna & Henri’s first storybook. It’s about Henri trying to get a birthday present for Hanna just in time for her birthday party. Hanna & Henri - The Robot is available in English and Swedish. Hanna & Henri - The Robot takes the form of a typical storybook app with 10 pages of original illustrations. The app has a few mini games integrated into the story. Kids can play dress-up, build robots, sort fruits based on their colors, and identify which object that don’t belong to the same category. The main two games in this story, dress-up and robot-building, have high replay value. Kids can dress up Hanna differently each time, and it will be reflected in the story. Similarly, they can also build a different robot each time. One of the mini games that you can play is a dress-up game. Hanna & Henri - The Robot is an original storybook about two active kids who enjoy recycling. It has several games integrated into the story, and two of the games can be played different each time. Parents can use the story to inspire kids ages 3+ to create their own robots (and toys) from scraps they find around the house.